When you insert a CD/DVD disc into the drive, it begins playing music, running an application, or installing software automatically. This action is provided by a feature called AutoPlay. Some experienced Windows users find Autoplay annoying. For example, sometimes I don't know what's on a cd/dvd and I don't want programs executing without my express permission. • To stop Windows from automatically running a single CD/DVD disc, press and hold the [Shift] key down while inserting the disc in the drive. 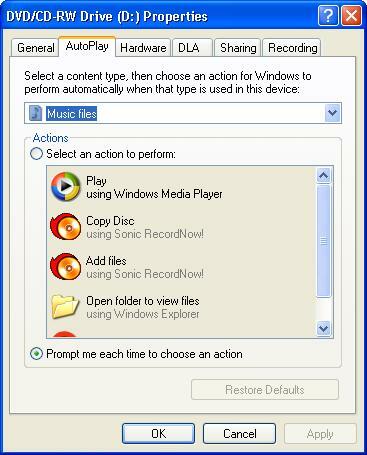 AutoPlay works by polling the CD/DVD drive every few seconds to see if a disk has been inserted. If Windows finds a disc that wasn't there last time it polled that drive, it looks in the root directory of the disc for a file named autorun.inf. Autorun.inf contains the name of an application to run. If no autorun.inf application is specified, Windows attempts to detect the type of content on the disc and launch the application configured for that type of content. If an application is not configured for the type of content on the disc, Windows will launch a dialog box asking what to do. In the dialog box you can select an action to take (or to take no action), and if you want this action to occur every time Windows detects that typem of content, you can set the "Always do the selected action" checkbox. 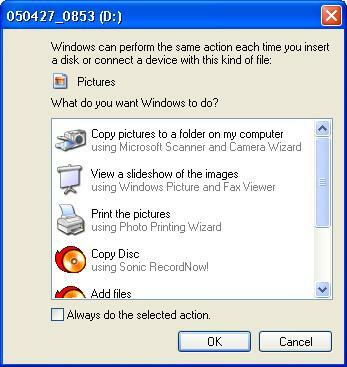 To preset what action Windows should take for each type of content, right-click on the CD/DVD drive icon and in the menu that appears select Properties. In the drive Properties dialog box that appears, select the AutoPlay tab. In the drop-down list select each type of content and set the "Select an action to perform" radio button. Then select an action in the list.